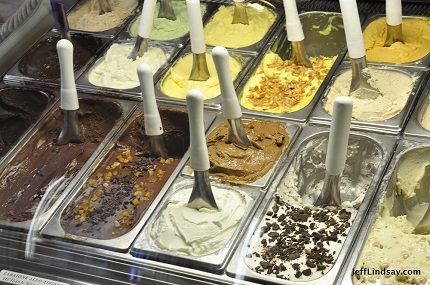 Are you inspired by gelato? I am. I didn't really appreciate gelato until our visit to Italy earlier this year, where the majesty of true gelato came as a surprising revelation to us. It's so much more than just ice cream! Now I'm proud to be a gelato convert. After returning to China, I've been on a quest for good gelato, and have found a couple of fairly good brands here that draw upon Italian know-how. Some gelato at a shop in downtown Rome, February 2014. Gelato was on my agenda following one of the best intellectual property conferences I've attended, the IP Business Congress Asia 2014, held Sept. 8-9 here in Shanghai, courtesy of Intellectual Asset Magazine. My wife and I took an IP lawyer from the States and his wife to dinner at one of my favorite restaurants in Shanghai (the beautiful and delicious TMSK in Xintiandi). After dinner, the lawyer and I wanted to try a little gelato, so I walked our group a little west to a small street in an older part of town to visit a gelato shop. This was an outlet for Le Creme Milano, a gelato chain in Shanghai where I've had some excellent gelato several times in the past. I was looking for another sublime experience. When we entered the store, something seemed a little different. The gelato bins, normally full and carefully groomed, looked sloppy and the trays were mostly empty. What remained looked rather like old relics. We did the best we could by finding a couple of flavors to order from the few surviving bins, but the flavor and texture was unimpressive. What had happened? Were sales so poor in our cooler weather that the store had just given up and failed to keep up appearances? I was let down and resolved to abandon my faith in that brand and not come back. The next day, I had lunch with another friend and mentioned the bad gelato experience. What happened was unusual and yet so typical for this land of strange coincidences. Though he had little interest in gelato, he had become friends with one of the leaders or owners in the business. He said he would give them my feedback to help them improve. He called me later that day to tell me surprising news from the owner: the gelato store we had visited was a fake, or, in LDS lingo, an apostate operation. How ironic that a couple of IP guys following a big IP conference would end up having our dessert in a fake shop, served by an alleged IP infringer. According to the report my friend gave me, that store began as a legal, properly authorized franchise using Le Creme Milano's branding and product, made at a central shop on South Shaanxi Road. But recently the shop near Xintiandi went rogue, he said, allegedly refusing to buy the product from the source. Instead, I guess, they are finding some other source and operating on their own, not according to directions and policies from the central authority. That explains why things looked and tasted so poor. This was a rogue store apparently selling their own brand of apostate gelato. Having severed the connection with the source of authority, the continuously refreshed supply of real gelato was gone. Perhaps some of the gelato in the bins was original from the true source, but even if that was the case, there was definitely a need for fresh refilling. Individuals or organizations can go rogue and lose connection with the source of authority, even when the outward appearances suggest otherwise. The rogue shop had the right outward signs and had plausible gelato inside, but something was wrong and the experience was far less inspired and inspiring than it should have been. People and groups can go rogue in several ways, such as by deliberately breaking agreements/contracts/covenants, rejecting some of the terms of the contract, rejecting those who legally administer the contract, making sincere but ill-advised unilateral changes, or just insisting on sticking with the old and not accepting the new product that needs to be accepted (or purchased, in this case). It all results in the same thing: a store that doesn't provide the authorized product the way the franchise owner intends, and an inferior experience for the customers. The inspiring gelato some of us seek needs to be kept fresh, continuously receiving new supplies from the authorized source. Apostate gelato can still taste good, but there's something missing. I'll be going back to Le Creme Milano after all, but to the authorized main store where the real stuff is made. There I'll contemplate not only the majesty of great gelato, but also the significance of the Restoration, the importance of continuing revelation, and the ease which apostasy can occur. Apostasy, great or small, institutional or individual, can occur we sever connections or weaken relationships with the Source of authority and continuing revelation. Stick with the real stuff.